MyBaby by HoMedics offers a premium line of sleep machines to help your baby sleep through the night. 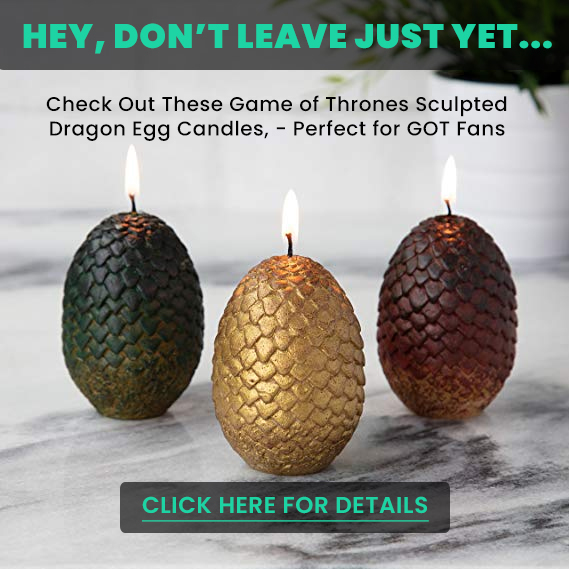 Whether you’re looking for baby sleep sounds, white noise machines, nightlights, or humidifiers, MyBaby has all the best solutions to keep you and your baby comfortable and sleeping soundly at home of on-the-go. At HoMedics, we understand that better sleep for baby means better sleep for the whole family! The MyBaby SoundSpa On-the-Go is the perfect, travel-ready sleep machine to keep your baby relaxed and sleeping well while you’re traveling. 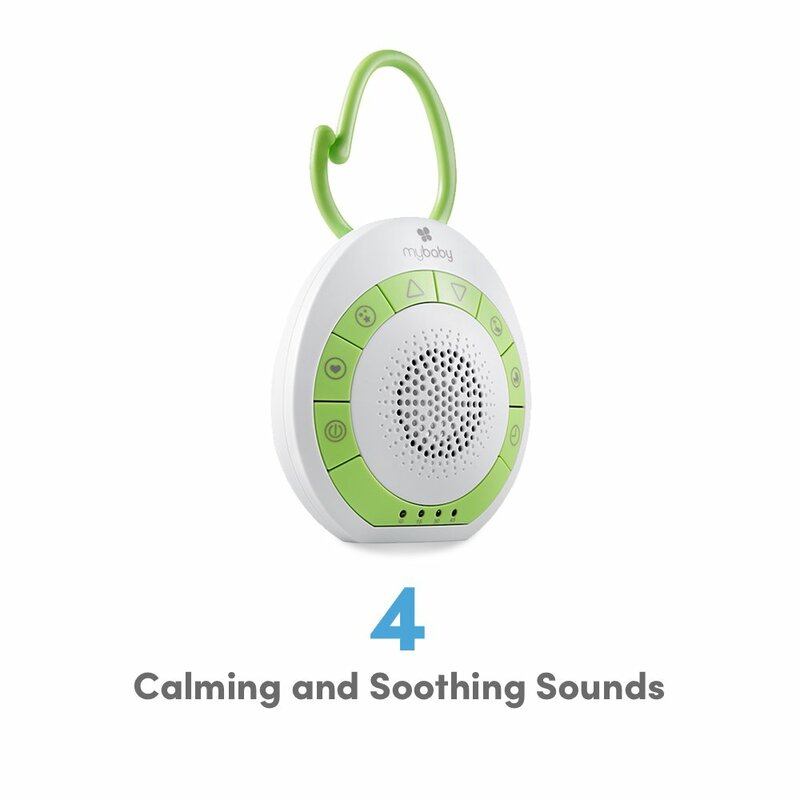 This handy SoundSpa offers 4 soothing sounds, including Heartbeat, White Noise, Ocean, or Lullaby. You can choose yours or your baby’s favorite sound to create a more relaxing and peaceful environment so that when you’re traveling, your baby feels at home away from home. 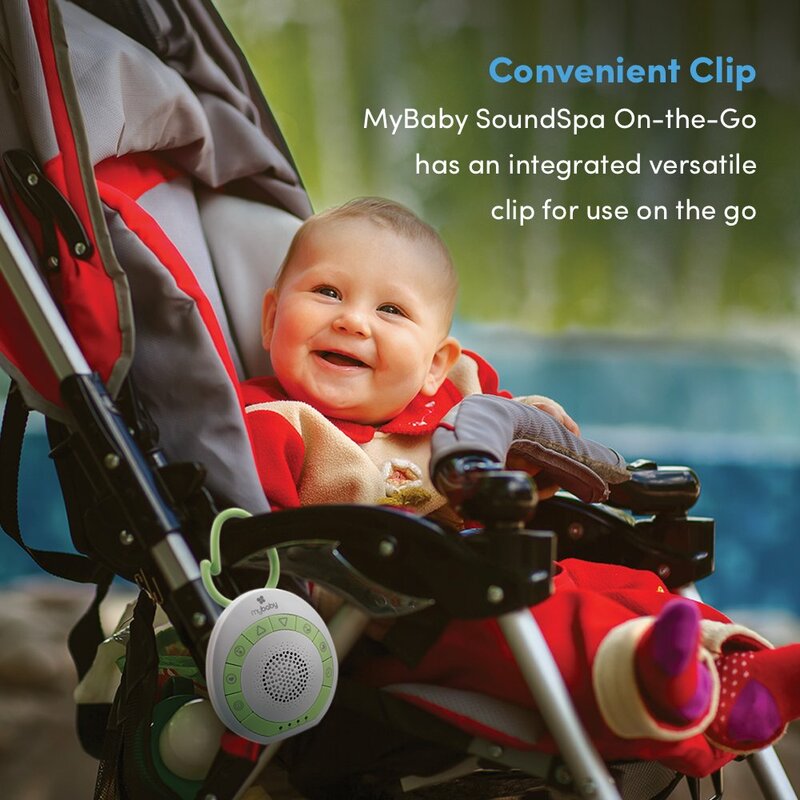 This SoundSpa comes with a convenient, integrated clip that allows you to attach it to your baby’s stroller, diaper bag, crib, height chair, playpen, car seat, and more. This SoundSpa is also made of durable, hard plastic so that it can withstand most bumps and tumbles – whether during playtime with baby, in your suitcase or diaper bag, or while attached to your car seat or stroller. 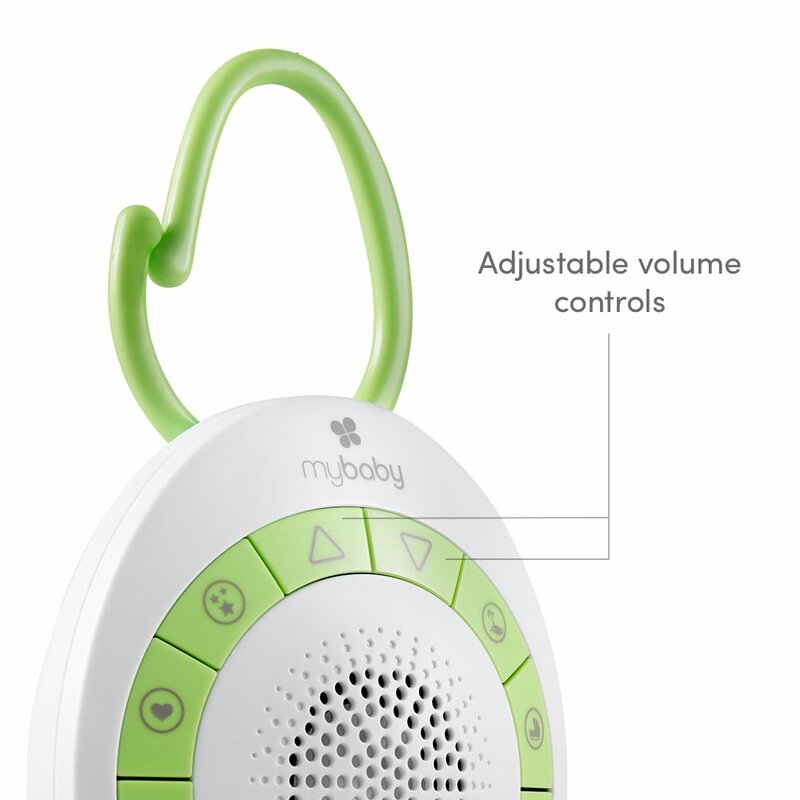 In addition to being small and portable, the MyBaby SoundSpa On-the-Go is powered by 3 AAA batteries (not included). Being battery operated, you won’t be limited by the length of a cord. 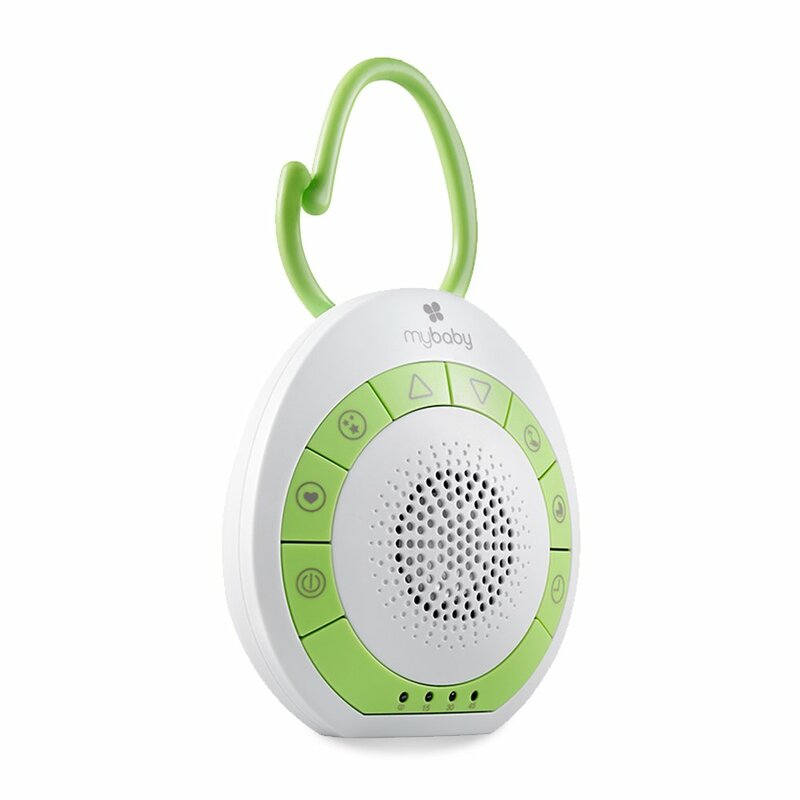 Play your baby’s favorite relaxation sounds wherever you go! 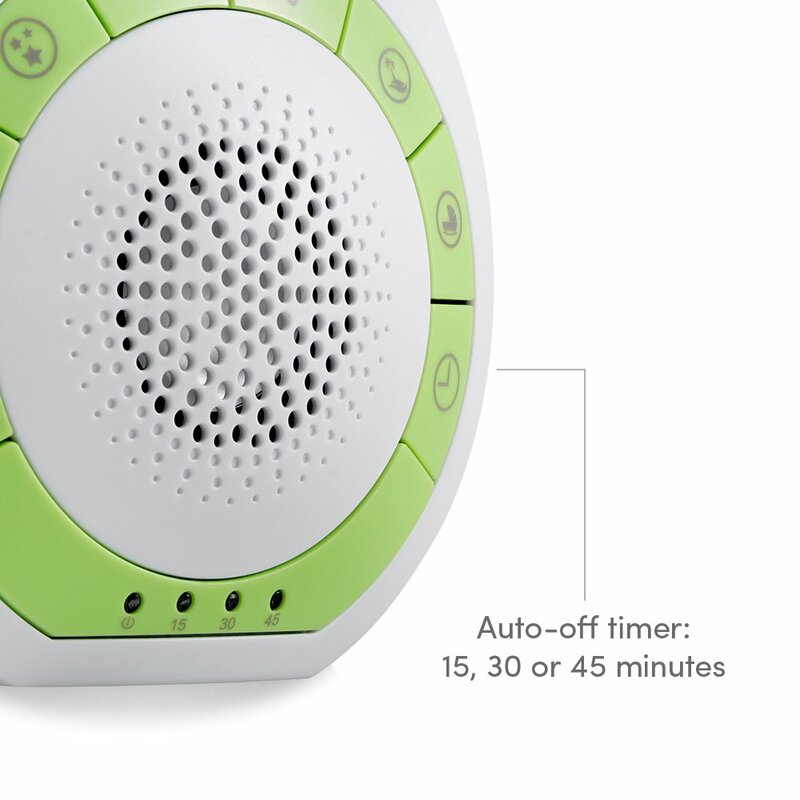 To save on the battery life, this SoundSpa has a built-in auto-off timer that allows you to set your child’s relaxation sounds to play for 15, 30, 45, or 60 minutes. After the allotted time, the SoundSpa will automatically power off, allowing you and your little one to relax even more. We know that better sleep for baby means better sleep for the whole family. Take the MyBaby SoundSpa On-the-Go with you wherever you go and rest easy. BATTERY OPERATED & AUTO-OFF TIMER: To make this SoundSpa extra portable, it is powered by 3 AAA batteries (not included) so there are no cords to tie you down. In addition, you can help conserve energy by setting its built-in auto-off timer for 15, 30, 45, or 60 minute intervals. This SoundSpa is perfect for when you’re putting your baby down for a nap while traveling in the car, stroller, or anywhere you may go!